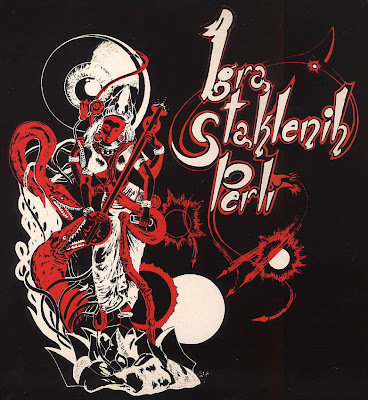 IGRA STAKLENIH PERLI, the ultimate ex-Yugoslavian space/psychedelic rock band, was formed in 1976 in Belgrade, Serbia, having been named after the famous novel by Hermann Hesse - "Das Glasperlenspiel" (The Glass Beads Game). The original line-up consisted of: Zoran Lakic (keyboards), Vojkan Rakic (guitar), Predrag Vukovic (percussions) and Drasko Nikodijevic (bass & vocals). In late 1977 Dragan Soc joined the band as drummer while they played live concerts at Belgrade clubs, preparing to start recording their first album, which they did in mid 1978. Upon its release the next year, the band gained reputation for elaborated visual stage effects and light show directed by their friend Goran Cvetic. Nikodijevic was replaced by rock journalist Slobodan Trbojevic on bass prior to recording the second album in late 1979. After its release in 1980 the guitarist Ivan Pajevic replaced Rakic and Nikodijevic was back on bass, but shortly the band ceased to exist. Nikodijevic and Rakic later formed post-punk/neo-psych White Rabbit Band but in late 1980s moved to USA where they continued under the name White Rabbit Cult. The remaining members together with German publisher Thomas Werner released at the beginning of 1990s three albums of ISP old live material and album outtakes for the German-based label Kalemegdan Disk. IGRA STAKLENIH PERLI labelled their music style as "stream of consciousness music". Their both studio albums, the first eponymous "Igra Staklenih Perli" from 1979 and the second "Vrt Svetlosti" from 1980, are pretty similar in sound and resemble the style from early PINK FLOYD and HAWKWIND psychedelia, to German kraut-rock (notably CAN and TANGERINE DREAM), to HILLAGE-era GONG among many. Interesting music effort especially considering the fact it was the new wave boom period when they tried to pursue a quite different music philosophy. Recommended listen to any devoted prog fan. Since all their albums were issued on vinyl format it might be difficult task to find them, but Kalemegdan Disk may be a good starting address.